The Venetians built the church itself in 1555, and later additions included an impressive seventeenth century doorway. 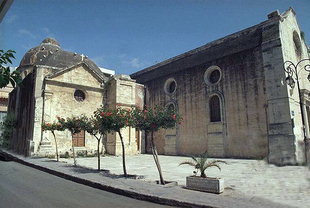 The church was part of a monastic school which became an intellectual centre on the island. Among the school's students were the poet Kornaros, author of the Cretan classic, Erotokritos, and many learned Orthodox theologians. 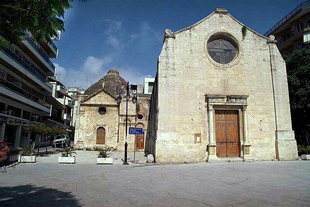 Agia Ekaterini houses a Museum of Religious Art. Originally, Agia Ekaterini served as an art school where Byzantine and Renaissance painting styles blended to form a style known as the Cretan School. The museum collection centres around six icons by Michalis Damaskinos, one of the school's notable pupils and contemporary of another well-known student, Domenicos Theotokopoulos, ''El Greco''. Starting on the west wall of the exhibit, mixed among other paintings, are the sixteenth century Damaskinos icons: The Adoration of the Magi ( the second exhibit); The Last Supper (the fifth exhibit); The Virgin with the Burning Bush (the eighth exhibit); Christ Appears to the Holy Women (the ninth exhibit); The Ecumenical Council held at Nicea, 325 A.D. (the twelfth exhibit); and The Divine Liturgy (the fifteenth exhibit).